The Math Emporium Art Project is a collaborative project with CPCC Visual Arts Department and the Math Emporium to fill the space with math-theme works of art created by CPCC students. 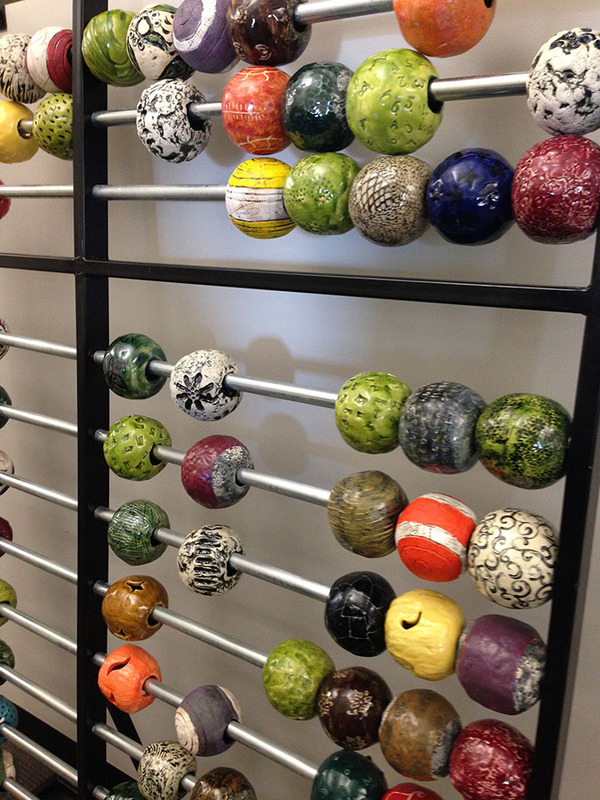 On January 16, 2015, the first work–Abacus–was installed. 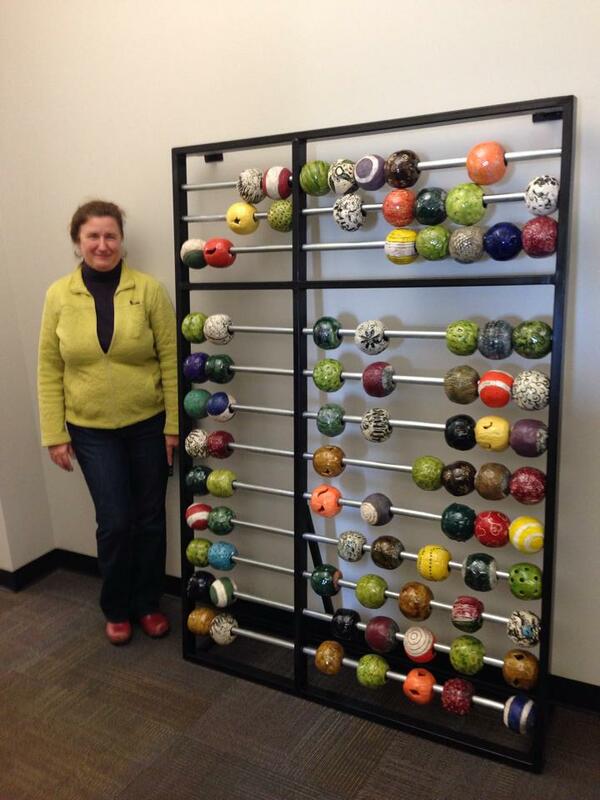 CPCC Instructor Paula Smith with "Abacus"
An Abacus, or counting frame has been in use centuries before the formal written numeral system, and is still in use in many cultures today. Though ancient in origin, the abacus is still utilized in the early years of institutional schools as an aid in teaching arithmetic. Visually impaired learners find using the abacus helpful because of its physical nature. The earliest abacus that used beads on rods dates from the 11th century in China and was called a suan pan, which means “calculating plate”. It is felt by many that using the abacus strengthens the student’s sense of number placement value and helps to further a better overall understanding of numbers. In 1979, the Chinese Abacus Association was founded. Forbes.com ranks the abacus as the second most important tool of all time. The CPCC Visual Art Department was invited by the Math Emporium to submit ideas based on mathematical themes. Paula Smith volunteered her Advanced Ceramics class and asked them to come up with various design concepts. Many ideas were thrown around until it was decided that a large, interactive abacus would be the best option. All of Smith’s Advanced Ceramics students were assigned to make ten- four inch hollow ceramic balls, which could be individualized by using stamps, textures, and/or cut-outs. Students then used colored under glazes and/or glazes to finish the surface treatments. Smith and class made 104 balls, giving them some room for final design options. With assistance from Ashley Knight, CPCC Sculpture Instructor, a metal framework was formed to complete the design. “Abacus” is a large-scale, interactive sculpture that invites the viewer to touch by moving the balls and desires to become a public art focal point for the Math Emporium and their students. More installations coming soon! Drawings and photography! The Math Emporium Art Project is now accepting proposals for Spring 2015. Please contact Project Manager, Carolyn Jacobs at carolyn.jacobs@cpcc.edu for more information. This entry was posted in Ceramics, Faculty, Gallery, Math Emporium Art Project by Carolyn Jacobs. Bookmark the permalink.